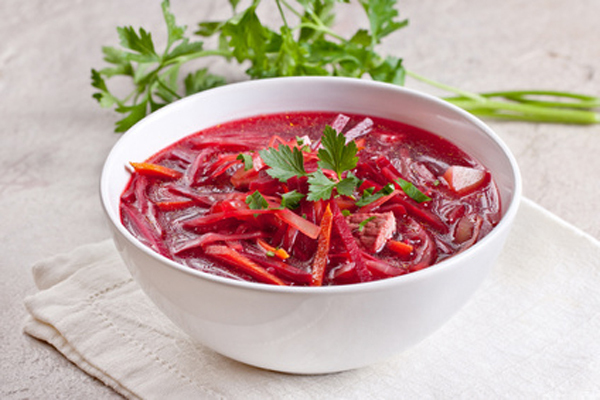 NOTE: A beetroot soup recipe that has it's origins in the Ukraine. Widely enjoyed across many Eastern European countries this variation is more akin to the Polish recipe which also contain onions, carrots and potatoes. Cut the vegetables and reserve. Sautee the onions, the potatoes, the beetroot cubes in half of the sesame oil, add the salt and cook over a gentle flame for a few minutes. In the meantime sautéed the carrots and beetroot julienne in the remaining sesame oil. Cook for about 5 minutes, remove from pan and reserve. Add water or stock to the soup, just enough to cover the vegetables and cook as long as you can, until the vegetables are soft. When ready , mash the vegetables with a potato masher (do not put into a blender or food processor; the idea is to have a coarse soup, not a cream soup). Add the remaining stock or water and bring to another boil. Adjust the seasoning with salt and a small amount of soya sauce. Add the vinegar. Continue to simmer; you want all the flavours to marry. Thanks to Jodie Holdway for this recipe. Jodie follows a macrobiotic, or wholefood, lifestyle which includes a high level of wholegrain in the diet and advocates growing your own food or sourcing local organic ingredients.